Here are some snazzy birthday facts about 22nd of January 1971 that no one tells you about. Don’t wait a minute longer and jump in using the content links below. Average read time of 10 minutes. Enjoy! What day was my birthday Jan 22, 1971? January 22, 1971 was a Friday and it was the 22nd day of the year 1971. It was the 4th Friday of that year. The next time you can reuse your old 1971 calendar will be in 2021. Both calendars will be exactly the same! This is assuming you are not interested in the dates for Easter and other irregular holidays that are based on a lunisolar calendar. There are 276 days left before your next birthday. You will be 49 years old when that day comes. There have been 17,621 days from the day you were born up to today. If you’ve been sleeping 8 hours daily since birth, then you have slept a total of 5,874 days or 16.08 years. You spent 33% of your life sleeping. Since night and day always follow each other, there were precisely 597 full moons after you were born up to this day. How many of them did you see? The next full moon that you can see will be on May 18 at 21:13:00 GMT – Saturday. Fun stat: Your first one billion seconds (1,000,000,000) happened sometime on September 30, 2002. If a dog named Sophie Pereira-Batista - a Great Pyrenees breed, was born on the same date as you then it will be 267 dog years old today. A dog’s first human year is equal to 15 dog years. Dogs age differently depending on breed and size. When you reach the age of 6 Sophie Pereira-Batista will be 45 dog years old. From that point forward a large-sized dog like Sophie Pereira-Batista will age 5-6 dog years for every human year. Second Anglo-Sikh War: The Siege of Multan ends after nine months when the last Sikh defenders of Multan, Punjab, surrender. KTLA, the first commercial television station west of the Mississippi River, begins operation in Hollywood. The New York City “Mad Bomber”, George P. Metesky, is arrested in Waterbury, Connecticut and is charged with planting more than 30 bombs. The Élysée Treaty of cooperation between France and Germany is signed by Charles de Gaulle and Konrad Adenauer. The Supreme Court of the United States delivers its decisions in Roe v. Wade and Doe v. Bolton, legalizing elective abortion in all fifty states. Pennsylvania politician R. Budd Dwyer shoots and kills himself during a televised press conference, leading to debates on boundaries in journalism. Evo Morales is inaugurated as President of Bolivia, becoming the country’s first indigenous president. Conan O'Brien performs his last Tonight Show on NBC as a part of the 2010 Tonight Show conflict. What does my birthday January 22, 1971 mean? 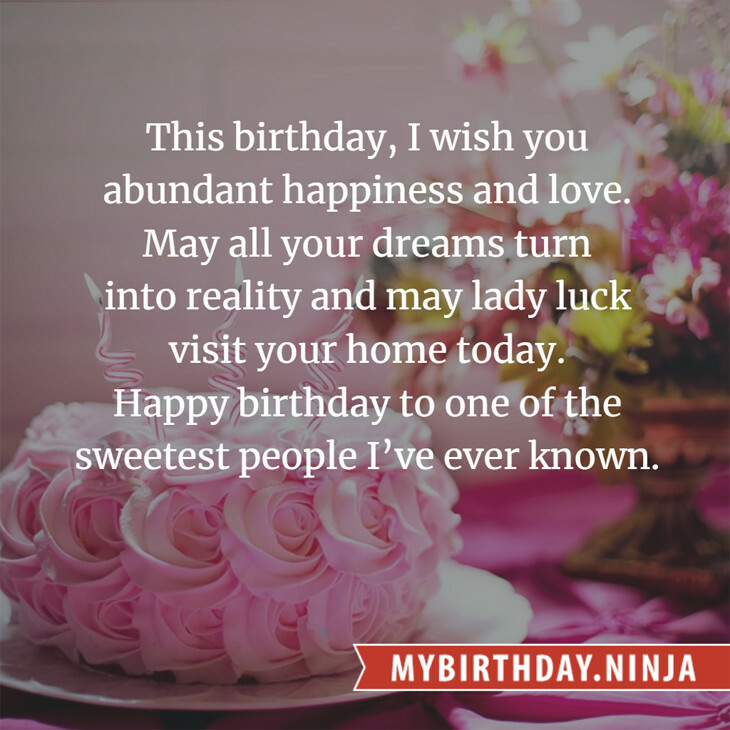 Your birthday numbers 1, 22, and 1971 reveal that your Life Path number is 5. It represents progress, adventure and opportunity. You possess the curiosity of a cat and long to experience all of life. The following celebrities also have the same life path number: Anna Proclemer, Taylor Mead, Gail Davis, Anthony Muñoz, Sargun Mehta, Lynda Day George, George Thorogood, Dante Basco, Shin Soohyun, Rebecca Holden. 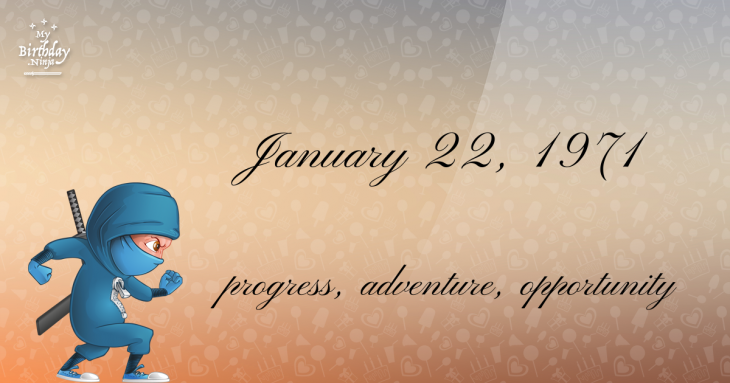 What is the birthday horoscope for Jan 22, 1971? The Western zodiac or sun sign of a person born on January 22 is Aquarius ♒ (The Water-bearer) – a fixed sign with Air as Western element. The ruling planet is Uranus – the planet of originality. According to the ancient art of Chinese astrology (or Eastern zodiac), Dog is the mythical animal and Metal is the Eastern element of a person born on January 22, 1971. Fun fact: The birth flower for 22nd January 1971 is Carnation for friendship. What is the Love Match for Jan 22, 1971? When it comes to love and relationship, you are most compatible with a person born on February 7, 1997. You have a Love Match compatibility score of +164. Imagine being in love with your soul mate. On the negative side, you are most incompatible with a person born on August 24, 1955. Your incompatibility score is -123. You’ll be like a cat and a dog on a love-hate relationship. Arf-arf, I want to bite you. Meow-meow, stay away from me! The number-one hit song in the U.S. at the day of your birth was Knock Three Times by Dawn as compiled by Billboard Hot 100 (January 23, 1971). Ask your parents if they know this popular song. How many babies were born on January 22, 1971? Base on the data published by the United Nations Population Division, an estimated 121,818,445 babies were born throughout the world in the year 1971. The estimated number of babies born on 22nd January 1971 is 333,749. That’s equivalent to 232 babies every minute. Try to imagine if all of them are crying at the same time. What is the popular baby name on 22 Jan 1971? Here’s a quick list of all the fun birthday facts about January 22, 1971. Celebrities, famous birthdays, historical events, and past life were excluded. Try another birth date of someone you know or try the birthday of these celebrities: April 12, 1942 – Bill Bryden, Scottish actor, director, and screenwriter; September 25, 1975 – Declan Donnelly, English actor and singer; December 22, 1993 – Meghan Trainor, American singer-songwriter.